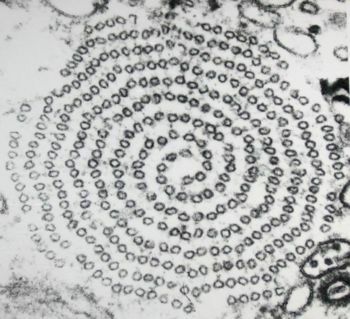 Spiral arranged microtubules visible in a cross-section of an axopod from a heliozoan protist. Microtubules are long, vacant, unbranched cylinders about 25 nm in diameter and is equal several micrometers long. There are two rules of Microtubules in the cell: Microtubules can form an internal skeleton for some cells, known as the cytoskeleton, and they also acts as a configuration forth which motor proteins can move structures in the cell. Microtubules are assembled from molecules of protein called tubulin. Tubulin is a dimer--a molecule made up of two monomers. The polypeptide monomers that make up this protein are known as alpha-tubulin and beta-tubulin. There are thirteen chains of tubulin dimers enclose the central cavity of the microtubule. Tubulin dimers can be added or subtracted, especially at the plus end, and the microtubules can turn longer or shorter. This capability of change the length rapidly will makes the microtubules dynamic structures, and this dynamic property of microtubules is also can be seen in animal cells, where they are often found in parts of the cell that changes the shape. 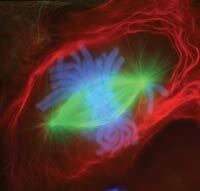 Many microtubules radiate from a region of the cell called the microtubule organizing center. Tubule polymerization cause rigidity, and tubule depolymerization can destroyed this hard structure. Microtubules help control the arrangement of the cellulose fibers in the cell wall of plants. 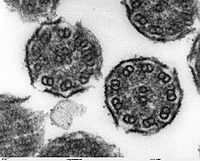 Electron micrographs of plants often show microtubules lying just inside the plasma membrane of cells that are forming or extending their cell walls. Experimental alteration of the orientation of these microtubules leads to a similar change in the cell wall and a new shape for the cell. Three dimensional structure of a microtubule. In these cells, actin filaments appear light purple, microtubules yellow, and nuclei greenish blue. Microtubules, microfilaments, and intermediate filaments are the three components of the cytoskeleton. The cytoskeleton is an important, complex, and dynamic cell component. It acts to organize and maintain the cell's shape; anchors organelles in place; helps during endocytosis, the uptake of external materials by a cell; and moves parts of the cell in processes of growth and motility. There are a great number of proteins associated with the cytoskeleton, each controlling a cell’s structure by directing, bundling, and aligning filaments. The inside of cilia contain precisely arranged microtubules visible in this cross-sectioned. Flagella and cilia are whip-like organelles that may push or pull a cell through its aqueous environment, or they may move surrounding liquid over the surface of the cell. Flagella are longer than cilia, and flagella are usually found singly or in pairs. Waves of bending propagate from one of a flagellum to the other in snake-like undulation. Cilia and Flagella both contain micro tubes that are arranged in an outer ring of connected microtubules which are around a non connected pair of microtubules. This arrangement is located beneath the plasma membrane. Newt lung cell seen during the metaphase stage of mitosis under a light microscope and colored using fluorescent dyes: chromosomes in blue, and spindle fibers (bundled microtubules) in green, and intermediate filaments in red. This page was last modified on 27 July 2014, at 17:18.